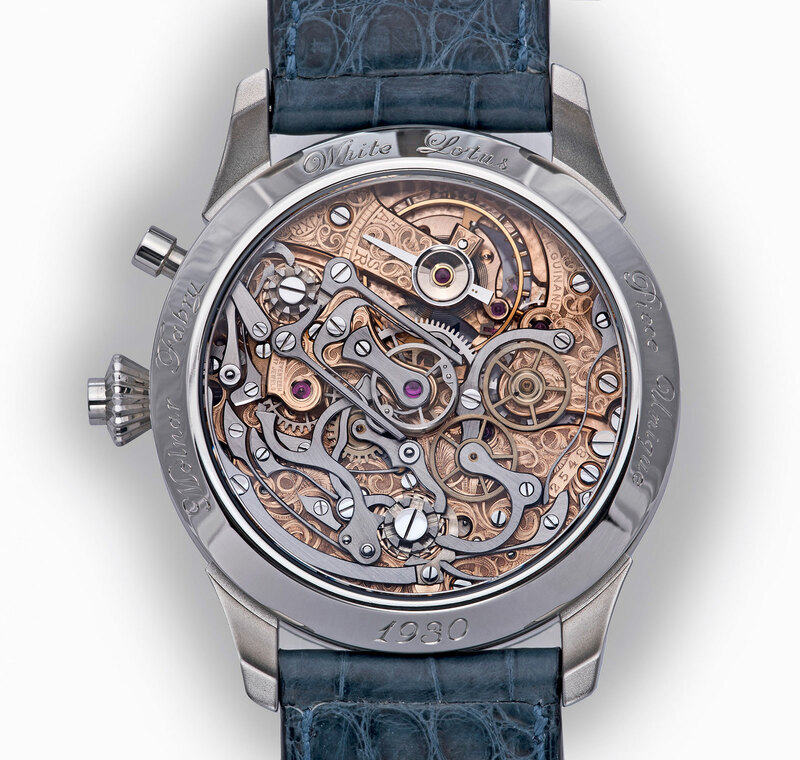 Inside sits a 1930s rattrapante movement that's been open-worked, engraved and carefully decorated. Founded by a pair of young watchmakers, Molnar Fabry specialises in heavily decorated, customised watches. Named after founders Michal Molnar and Igor Fabry, the firm is based in Slovakia and produced only a dozen or so watches a year. 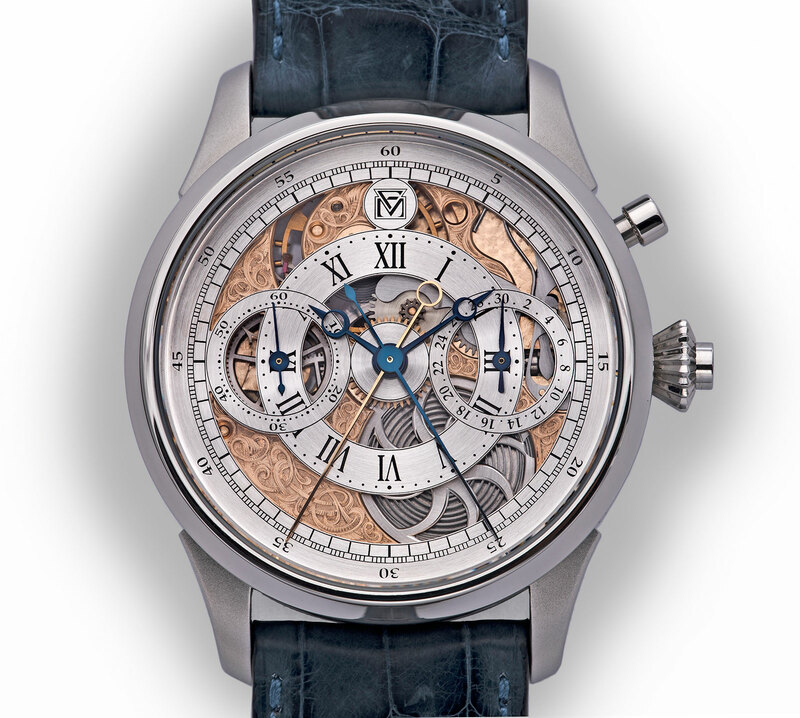 Trained as jewellers, the initially focused on gem-set watches, but have since completed a diverse range of complicated timepieces, including tourbillons utilising modern day Christophe Claret and Technotime movements. The latest custom timepiece from the duo is the White Lotus Rattrapante, a one-off, single-button split-seconds chronograph equipped with a rebuilt pocket watch movement from the 1930s. 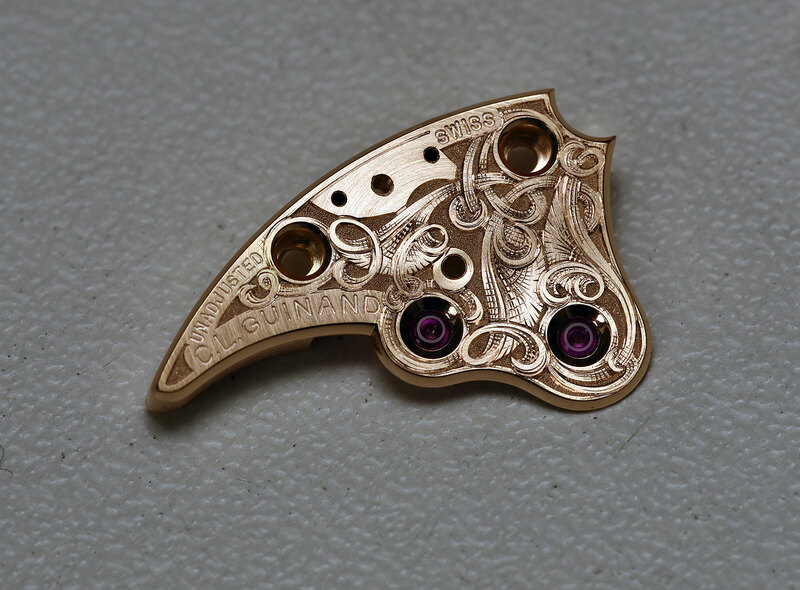 The White Lotus Rattrapante, on the other hand, is equipped with a monopusher split-seconds movement made in the 1930s by C.L. Guinand, a now defunct firm that specialised in chronograph pocket watches. 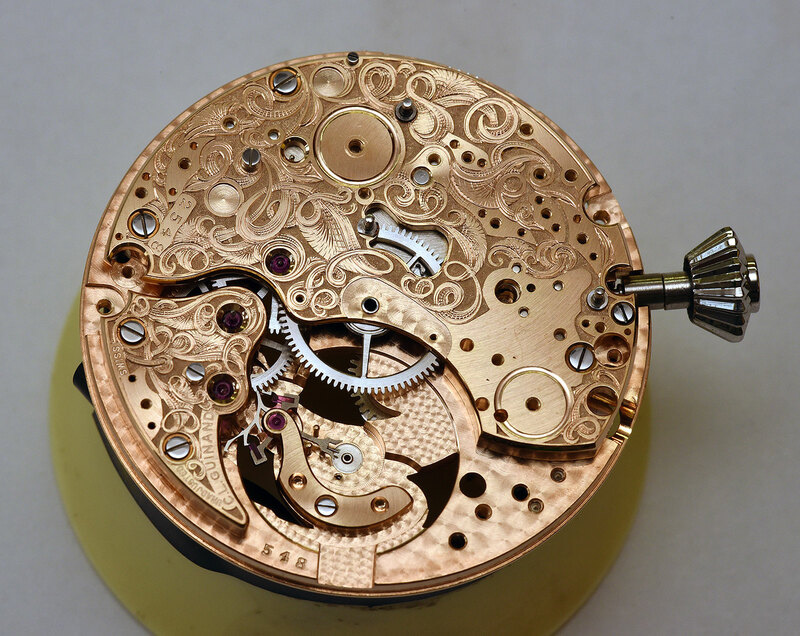 Functional but visually bare in its original state, the movement has been completely made over by Molnar Fabry. The bridges and main plate were plated in pink gold and engraved in the banknote style, a technique famously used for currency printing plates that uses fine lines and dots to create depth and detail. And to enhance the decorative effect, the three-quarter plate on the top and main plate on the bottom were partially open-worked. 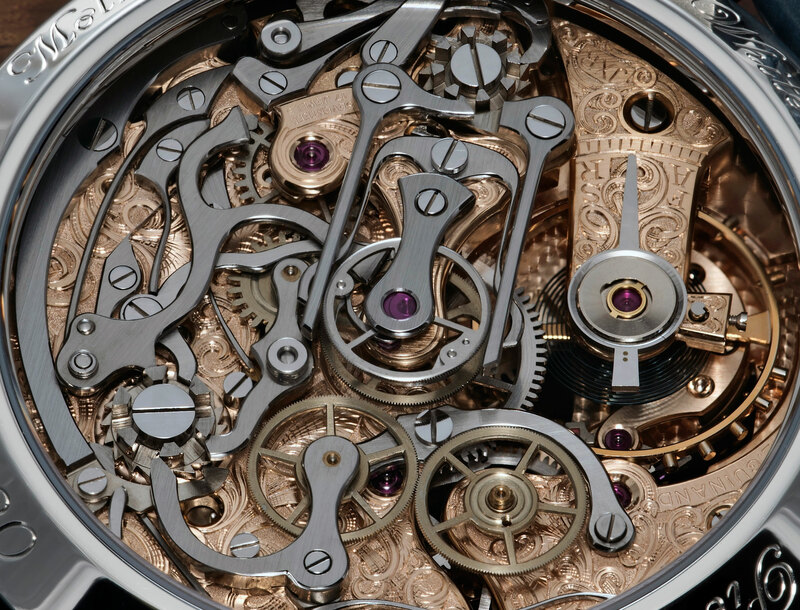 In addition, a handful of other components were also open-worked, most notably the barrel, which is visible on the front through the semi-skeletonised dial. 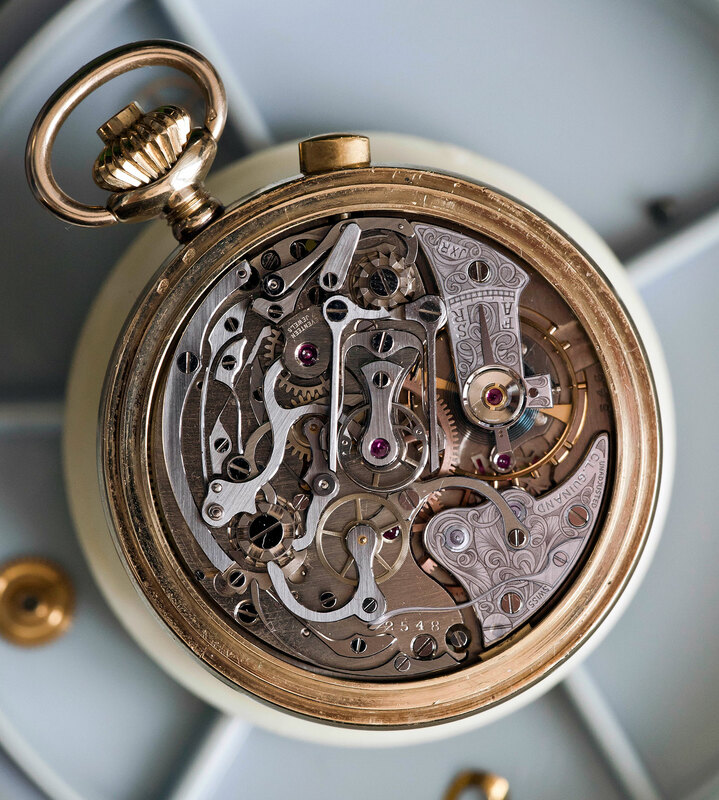 All other components were also refinished, with the steel springs and levers of the chronograph mechanism receiving particular attention, with polished, bevelled edges and straight grained surfaces. Because the movement was intended for a pocket watch, the resulting wristwatch conversion is similarly large. 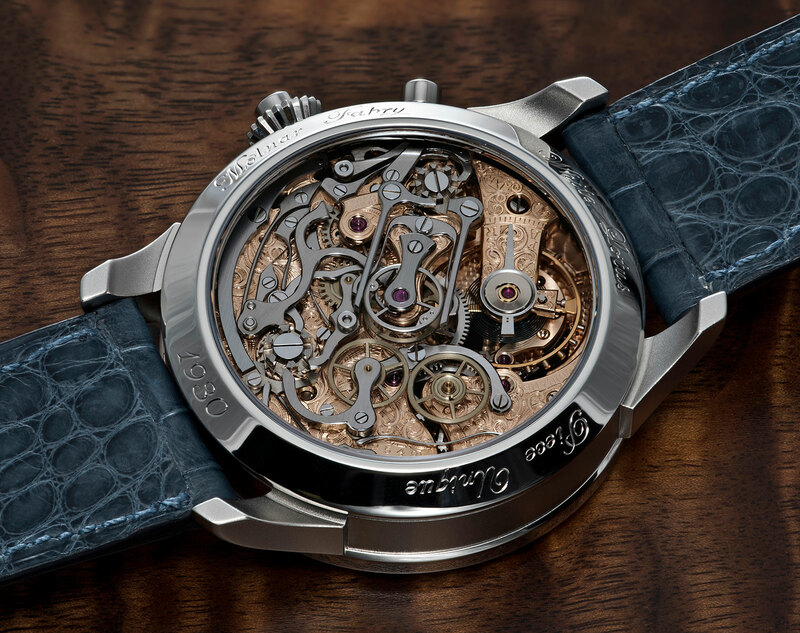 The stainless steel case measures 45.8mm in diameter, with the lettering on the case back engraved by hand. 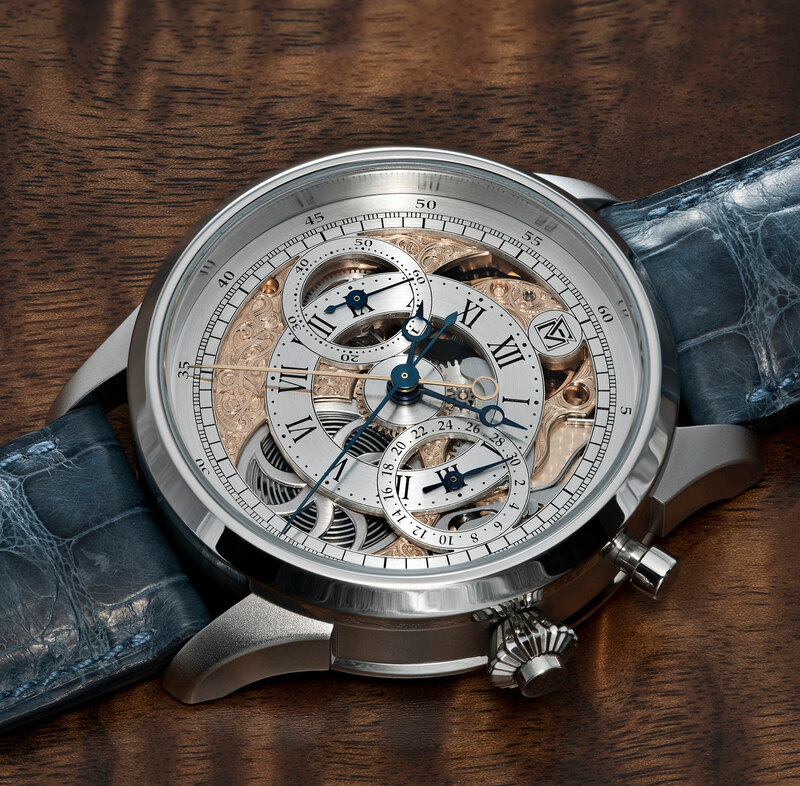 Made of pure silver, the dial is open-worked to show off the engraved base plate, while the hands are blued steel. The White Lotus Rattrapante is a one of a kind creation commissioned by a client, priced at €42,000. Molnar Fabry is able to undertake similar projects and can be reached via their website. Finnish watchmaker Torsti Laine introduces his first wristwatch, one that's powered by a hand decorated movement from the golden age of chronographs..